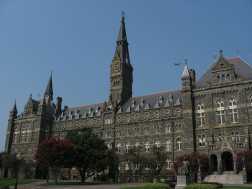 (AFP) Students at Georgetown University have approved a fund that would benefit the descendants of slaves sold by the elite Jesuit school in the 1800s. The fund would be the first of its kind in the country. It would be administered by a board made up of students and descendants of the slaves to provide money for the education of descendants and other charitable purposes.